Lviv, situated on the Boug and Dnestr rivers, was founded in 1256 and has a population of 728,350 as of 2016. Among the places to see are the 13th and 14th century Roman Catholic churches of Maria Snezhnaya and John the Baptist, the 14th-15th century gothic cathedral, and the 16th century Onufrievsky monastery. 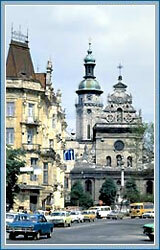 The main industries of Lviv are machine building, metalworking and woodworking. The pulp and paper industry, as well as musical instrument production, are also well developed. Lviv has a university and various institutes.